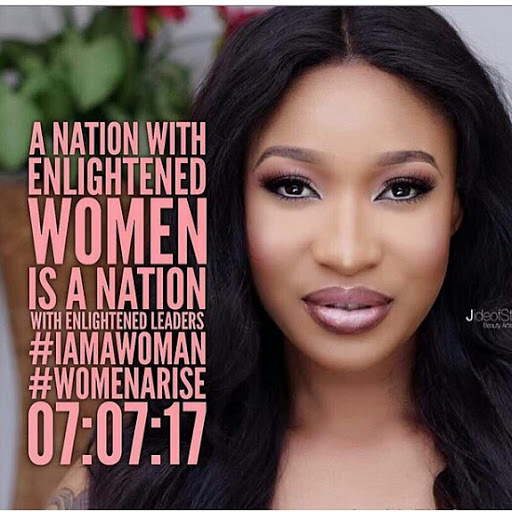 A woman enlightenment campaign tagged "Women Arise" dropping on the 7th July 2017, orchestrated by beautiful Dayo Amusa has since taken over the internet which has female celebrities and women of worth from all over Nigeria expressing their opinions regarding "self worth". "#Iamawoman with a platform, a woman privileged to be of influence to many other women. This comes with great responsibilities. I will strive to portray the strength of a woman in all I do. I will not let my fellow women down. We are strong, we are unique . We are Leaders. #WeareBeautiful #womenArise #IamaWoman #ofGrace".